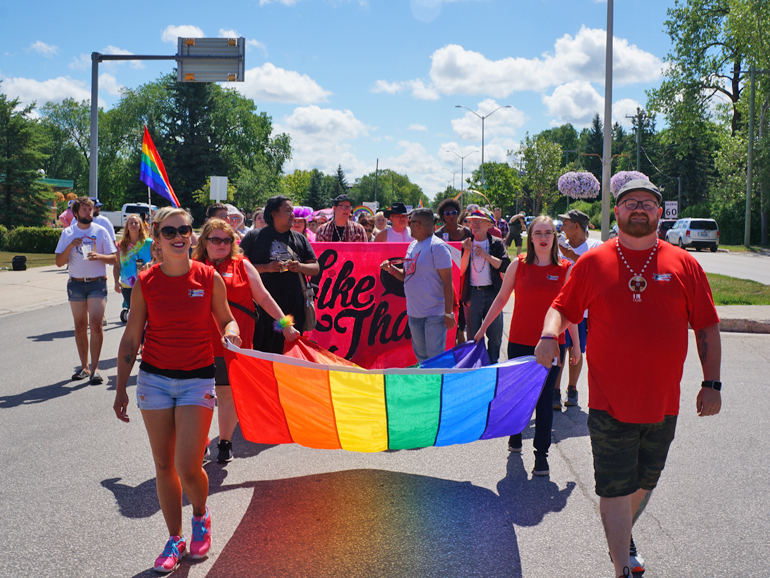 Steinbach’s third annual Pride March was held in downtown Steinbach on Saturday, July 21. SNFC was pleased to be represented by committee member Pearl Barz, who delivered an incisive address calling for our citizens to seek and find that common ground above and beyond our differences. Read a full account of the event here. Good morning, my name is Pearl and I am speaking to you this morning on behalf of Steinbach Neighbours for Community. We are a group of people, mostly local, but some from surrounding communities as well, who care about many forms of diversity and equality in our communities. For now we have identified and are focusing on the needs and challenges being faced among the LGBTTQI. Our resources have been put into having conversations, to provide insight, education and understanding, working to network and build bridges beyond one’s immediate social network. We want to promote greater inclusion for all people throughout Southeastern Manitoba, fostering healthy and wholesome communities. Over the summer months Pride parades and marches will be taking place all across Canada. We want to embrace events like this that work towards inclusion, acceptance and understanding of our neighbours, a place where we can all find common ground. Today we want to celebrate the people in our community who are making a difference. Today that is you, our neighbours. We all have opportunities every day to change the world. It’s amazing what the efforts of an individual or group of individuals can do to create change, if not in the world at least their local neighbourhood. Over the years I have had the privilege of listening to some wonderful Indigenous speakers. Often speakers start their address to a group with the phrase “to all my relations”. As I researched that phrase, taking a closer look, I learned that it is an Ojibwe phrase meaning – we are related, or all are related. Their understanding is that all living things are connected, to each other and to the Creator, the Higher Power. I cannot exist without you and you cannot exist without me. What I do affects you and others and what you do affects me. Everything we do has an effect on others and on our world. It seems to be a call to unity, nothing or no one matters more or less than the next person. The phrase brings us into harmony and equality with each other as we find common ground with everyone and everything. What can we do in our communities to bring us to this place, this place of unity? We can celebrate each other, living together as neighbours, valuing each person for who they are. Pride is about the varied expressions of the life, gifts, and talents of the entire community. Being different from each other doesn’t mean that we can’t be unified, even disagreeing doesn’t mean we can’t find common ground. Unity isn’t about being the same; it’s about accepting our differences and still being good neighbours, choosing to love and respect each other. We need to create an inclusive society that over-rides any differences, a community that ensures inclusion and equality of opportunity of all its members. So, I will borrow the Ojibwe phrase and say – “to all my relations” – let our words, attitudes, actions and involvements make our communities better places for everyone, celebrating our differences as we learn to find that common ground and live together as good neighbours.